Though we are selling our home, I plan to enjoy every bit of the exterior spaces this summer. I’ve been working outside on cool mornings, using fresh herbs in cooking and snipping fresh flowers for the house. Over the weekend, we had an Open House, and I brought in several fresh blooms. I’ve been using roses in our guest bath since earlier this spring, but our Hydrangea Bush has just started blooming in the last few weeks. I’ve pruned it the last two years and am finally starting to see the fruits of that labor. The Hydrangea blooms are fuller and more plentiful than they’ve been in years past. In fact, I’ve never wanted to pick any because there were so few on the bush. 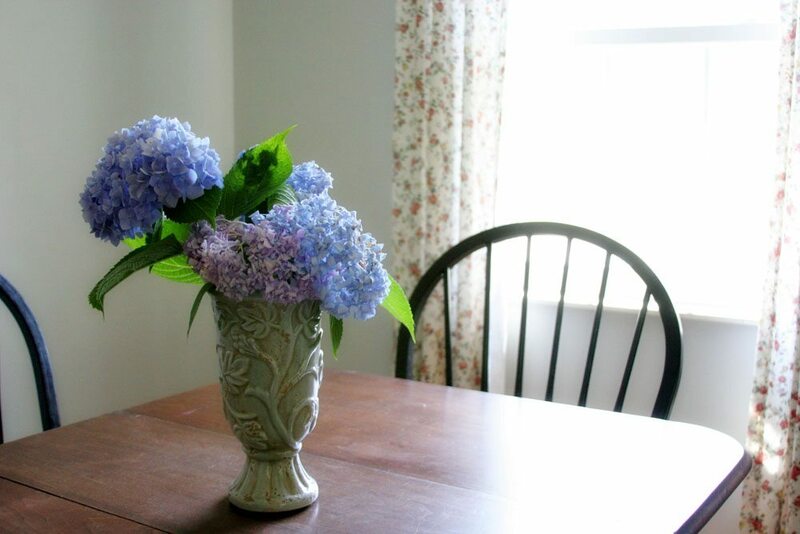 So, I can’t tell you how nice it has been to bring these into the Breakfast Area, and enjoy their beauty. The Breakfast Nook, at the end of our Galley Kitchen, is one of the spaces that got a facelift as we prepped the house to sell. I’ll be taking some photos and sharing more of it with you in the next few weeks. In all, it’s a fairly simple space. The wall color is a muted, soft gray. The chairs and table are neutral, as is the wall art. 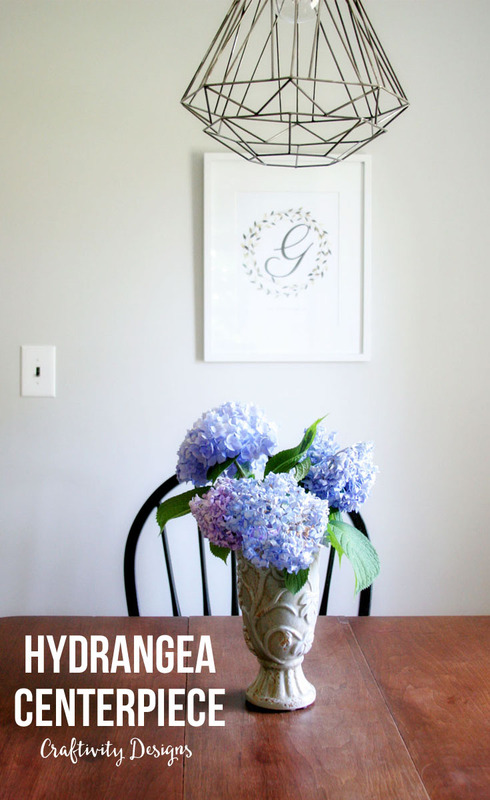 Yet, that simple color palette lets the Hydrangeas shine, in their natural beauty and color. It feels summery and fresh, with light pouring in through the windows and fresh flowers on the table. 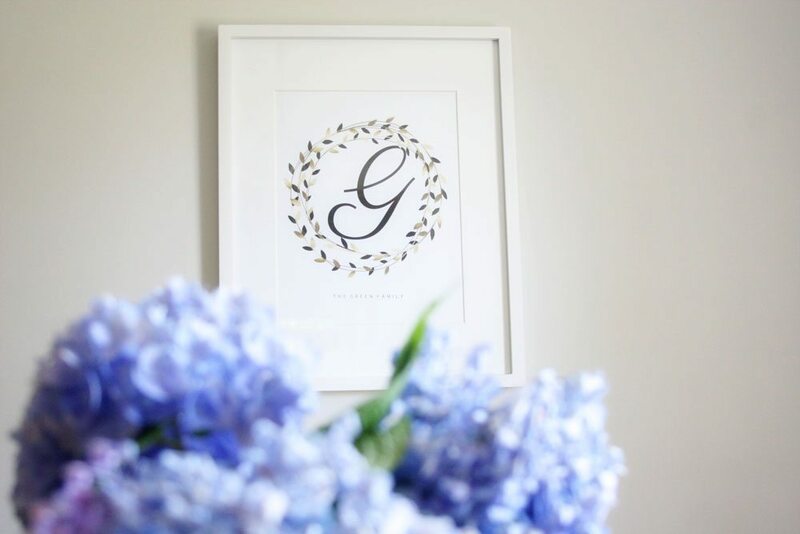 I’ve created a simple gift for your walls, too. 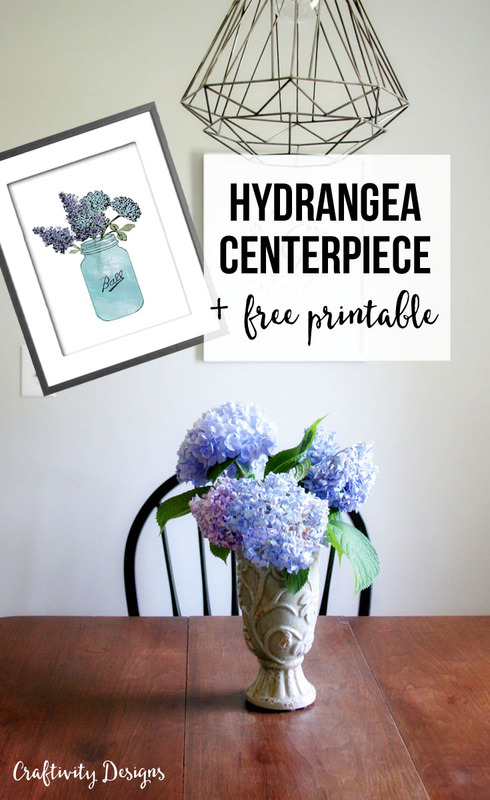 I’ve made a watercolor effect, 5×7 print, for you to download and print yourself. 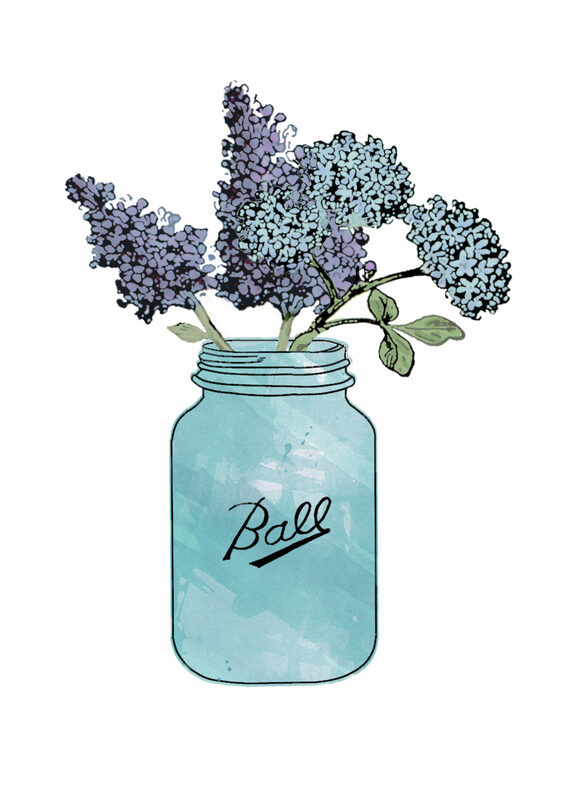 The artwork features a mason jar filled with blue and purple Hydrangeas, just like the ones from my yard. For personal use only, not to be re-sold or re-distributed. It’s kind of like I’m sending you a bouquet of fresh flowers, right? Thanks so much for being loyal readers… have a lovely summer week. 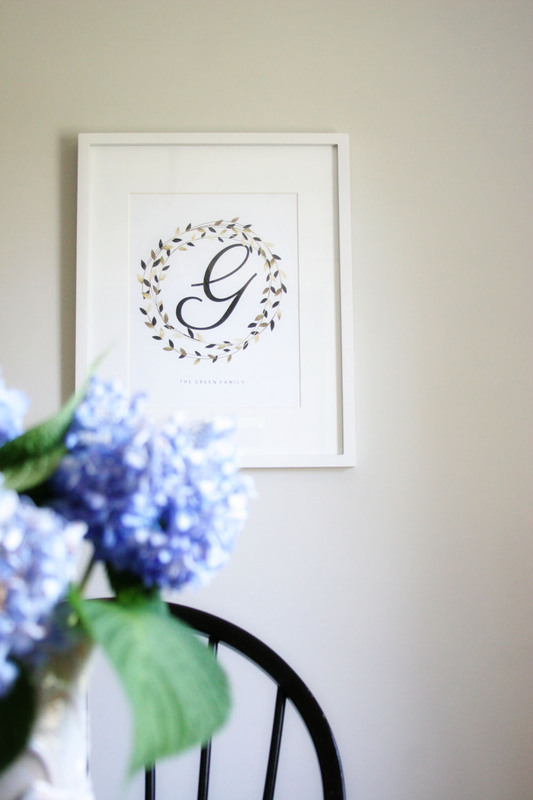 Love the hydrangea print. I just have to think where to use it. Yep! It just feels home-y to have fresh flowers. I love the smell of hydrangeas! They look beautiful in a vase alone on the table. I also spied that gorgeous light fixture above the table ? Good luck on your house selling adventures! 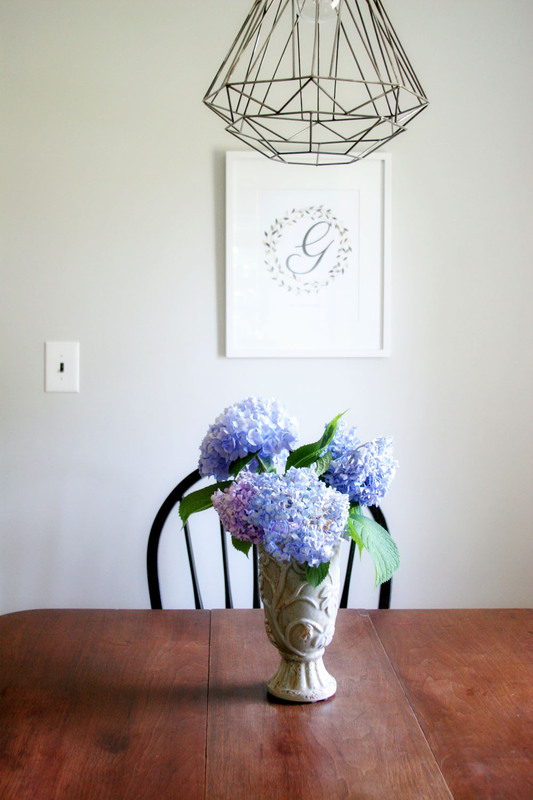 I got that light fixture from a local shop and need to share a bit more about it! Hopefully, soon!